ou find serenity while sewing and take pride in the projects you create, but does your sewing studio give you the same sense of satisfaction? Koala Studios complement your home as well as your creativity, providing a luxurious area for sewing and unsurpassed quality and unmistakable beauty. Most importantly, Koala Studios are custom built for your. From the height and color to the storage and surface areas, each Koala Studios is more than a home for your machine…. it’s a reflection of you. Koala Studios has the whole line up for the BERNINA owner. No matter what BERNINA sewing machine you own, there is a studio to fit your style and need. Find comfort, convenience and plenty of work surface with the BERNINA Sewing Station. The perfect companion piece for your sewing room when you need extra storage and space. Includes three large drawers and extra workspace to your suite by placing next to your studio. For sewers looking to organize their notions, the Storage Tower comes with five sizable drawers great for storing patterns, CDs, DVDs, or other sewing supplies. Choose from eight different elegant features. With wood grain ticking and rich color, each studio is as stunning as it is durable. Every inch of your studio — inside and out, including the rounded corners and beveled edges — is finished with Koala’s exclusive mar-resistant and water-resistant veneer. Finishes also available on Koala Studio accessories. 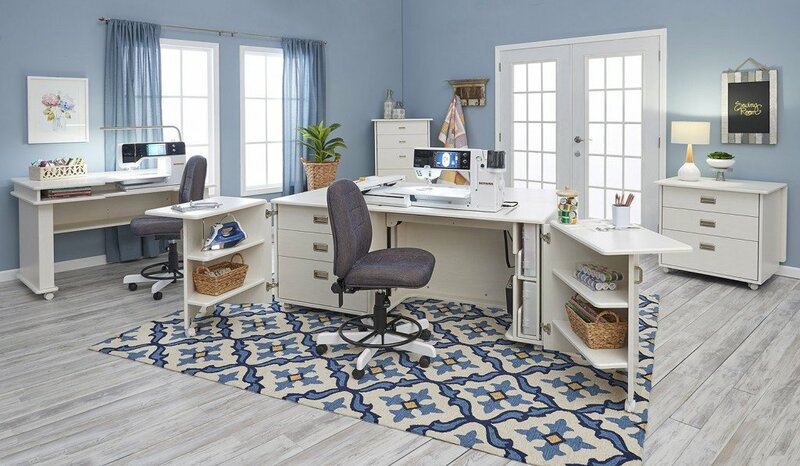 Create your dream sewing space with Koala Studios!